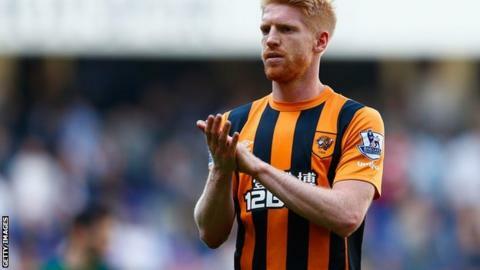 Relegated Hull City have released six players, including defender Paul McShane and goalkeeper Steve Harper. McShane, 29 joined the Tigers in August 2009 and made 136 appearances in all competitions while Harper, 40, played 31 times in two seasons with the club. Also leaving are defenders Joe Dudgeon, 24, Maynor Figueroa, 32, and Liam Rosenior, 30, and striker Yannick Sagbo, 27. Defender Alex Bruce and midfielder Stephen Quinn have been offered deals. Bruce, 30, who is the son of Tigers boss Steve, has made 74 league appearances in three seasons, while Republic of Ireland international Quinn, 29, has played 85 league games for the KC Stadium side. "Regrettably, following relegation, we have made the decision to release the majority of those players whose contracts have expired. We would like to place on record our thanks for the service they have given to the club," manager Bruce told the club website.